What Makes You Feel Fear? : Shots - Health News Some people with damage to a specific region of the brain called the amygdala do not feel fear. If you make them handle a snake or show them a scene from a scary movie such as The Shining, they won't be affected. But breathing in air with high levels of carbon dioxide can send them into a panic. 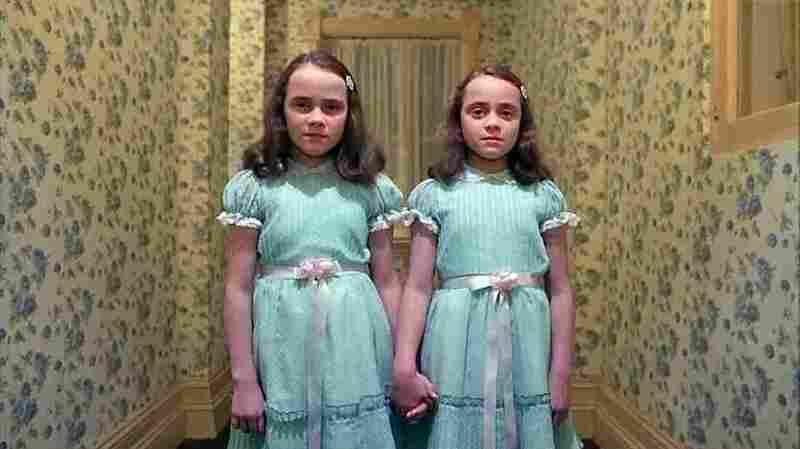 Movies like The Shining frighten most of us, but some brain-damaged people feel no fear when they watch a scary film. However, an unseen threat — air with a high level of carbon dioxide — produces a surprising result. In shorthand often used to describe the brain, fear is controlled by a small, almond-shaped structure called the amygdala. But it's not quite that simple, as a study published Sunday in Nature Neuroscience demonstrates. One of the best ways to figure out how parts of the brain work is to study people who have damage in those specific areas. Take a patient known as SM, a middle-aged woman with a rare condition called Urbach-Wiethe disease that has damaged the amygdala on both sides of her brain. A few years ago, SM told Justin Feinstein, then a graduate student at the University of Iowa in Iowa City, that she'd never felt fear, even when she'd been confronted by a knife-wielding assailant. Feinstein put her claim to the test. His group had SM handle a snake, took her on a tour of a haunted house and showed her scenes from scary movies like The Shining. SM was unfazed. But another University of Iowa researcher, neuroscientist John Wemmie, had a different test for SM: breathing carbon dioxide. In people without brain damage, exposure to high levels of carbon dioxide evokes fear and a hunger for air. In some, it can even set off a panic attack. "The body is not so good at detecting low levels of oxygen but is really good at detecting high levels of carbon dioxide," Wemmie says. And so Feinstein, Wemmie and their colleagues administered a new test to SM, along with a pair of twin sisters with similar brain lesions from the same rare disease. All three volunteers were exposed to high concentrations of the gas. In these brain scans, amygdala damage can be seen in three patients (known as SM, AM and BG) with Urbach-Wiethe disease. See the dark spots within the areas circled in red. A healthy person is shown (left) for comparison. The researchers thought that the patients would be insensitive to the test. "We were pretty shocked when exactly the opposite happened," Wemmie says. A few seconds after inhaling the gas, SM started to wave her hand towards the mask covering her face, crying "help me!" to a nearby experimenter. After the mask was removed, SM's skin was flushed, her nostrils flared and her eyes were wide open. When asked about the emotions the experience caused, SM replied: "Panic mostly, 'cause I didn't know what the hell was going on." The other two patients had similar panic attacks, saying they felt like they were suffocating. One even named her feeling as "fear." "All the patients found the experience highly aversive, and none of them found it pleasurable in a way that they'd want to do it again," says Feinstein, now a postdoctoral researcher at the California Institute of Technology. "This is interesting because it shows that the loss of the amygdala does not prevent [these patients] from experiencing fear altogether," says Caltech neurobiologist and Howard Hughes Medical Institute investigator David Anderson, who wasn't involved in the study. However, he notes, other studies have found that some patients with a damaged amygdala are capable of being afraid. "There is more to fear than just the amygdala," he says. Feinstein thinks that the fear induced internally by carbon dioxide may be processed differently in the brain than the fear caused by an outside source like a scary movie. It may be that learned fears and innate ones are handled differently. "We're still learning a lot about how the brain processes fear," he says, "and what this finding suggests is we still have a long way to go."